My research is motivated by my fascination with the startling amount of biodiversity in the world - I'm not just talking about species diversity, but also the diversity seen in the various and extraordinary morphological, behavioral, and physiological forms and functions that different organisms encapsulate. Specifically, I am interested in understanding both the present-day mechanisms that operate to structure species assemblages and allow for co-existence, as well as understanding how historical and eco-evolutionary processes acting through time have shaped the diversity we observe today. To address these questions I aim to use an integrative approach that incorporates functional ecology, evolutionary biology and phylogenetics, and spatial modeling. How do diverse communities maintain themselves, despite ample evidence of competitive exclusion via functional similarity, among co-existing species? Why are certain biogeographical regions more diverse than others, despite their similarity in ecological and geological age, and environmental composition? These are the questions that first inspired my scientific interests, and continue to motivate my research goals. Identifying the processes structuring the geographic distribution of species remains one of the biggest challenges for biologists today. Specifically, we often want to know why species occur where they do, regionally, and how they co-exist in diverse assemblages, locally. Although it is generally understood that current patterns of species diversity and species distributions are the result of ecological interactions acting over evolutionary time scales (Cody 1975; Ricklefs and Schluter 1993; Rosenzweig 1995; Ricklefs 2006), most ecological research to date has not incorporated an evolutionary perspective into studies of differential species distributions (Ricklefs 1987; Ricklefs 2004). My research aims to integrate both ecological and evolutionary theory, so as to understand the development of species diversity in ecological communities through evolutionary time. Imagine a plant community, as shown in the above figure. Looking just at the letters, we can identify species differentiation in the community represented by the two-dimensional rhombus. We may quantify species richness as 8, identifying species A-H as different. While this is useful, it tells us little more than the taxonomic differentiation in this community. Next, take a look at the shapes. There are different shapes (eg. rhombuses and ovals) and different sizes. Imagine that this differentiation in "functional space" helps us understand why these species can co-exist. Great. Ok. Stop there, right? Well, how did these traits that enable co-existence evolve, and why? 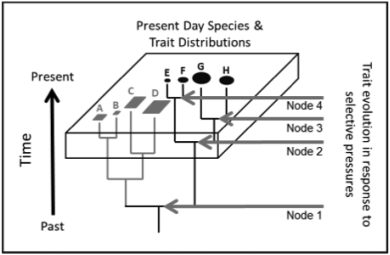 By looking at trait differentiation through time, with respect to species differentiation along environmental and geographical axes, we can not only identify why current species assemblages are distributed as we see them, but also how evolutionary processes in response to environmental and biotic interactions influenced species and trait diversification that is distributed across landscapes today. I am currently working with my PhD advisor, Dr. Kent Holsinger, on developing an empirical approach to addressing these questions in the shrubby Fynbos community in the Cape Floristic Region in South Africa. This region is exemplified by its incredible diversity, much of which is represented by endemic species. This prevalence of endemism allows us to track community assembly via the diversification of several independent plant radiations. I look forward to developing this research program with Dr. Holsinger, and fellow colleagues of the South Africa Dimensions of Biodiversity Group, into the future. Hanging out at the Dunedin Botanical Gardens, in search of Pittosporum! My MSc research at Michigan State University in the Swenson Lab involved the investigation of the mechanisms that contributed to species diversity in the New Zealand Pittosporum (~23 endemics to NZ, attributed to 2 independent colonization events, Gemmill unpublished), and those that continue to structure species distributions and species co-occurrence of this diverse genus of plants today. We found that Pittosporum diversified into different environmental niches, with respect to temperature and precipitation regimes, and that there was coordinated evolution of wood and leaf traits, and those corresponding to water use efficiency. This suggests that species in this genus differentiated with respect to both environmental niche, and functional traits. When evaluating co-occurring species, however, we found that there was no indication that they exhibited any pattern of phylogenetic dissimilarity (if we assume niche conservatism, we may expect that co-occurring species would be phylogenetically dissimilar as to utilize different niche space), or trait dissimilarity for most traits. In fact, we observed patterns of environmental filtering with respect to hydraulic traits and leaf photosynthetic traits, suggesting that the traits we evaluated were important for structuring species distributions across environmental gradients. However, the mechanisms responsible for allowing co-occurrence of these congeners on local scales are still being investigated. The results of this study are especially interesting in considering how the traditionally measured "functional traits" actually contribute to species co-existence. Our research indicates that it is not differentiation in these traits that facilitate co-existence, but some other aspect of unmeasured plant form and function. This research could not have been possible without the generous funding from the NSF East Asia and Pacific Islands Summer Institute fellowship, as well as the technical and intellectual support I received from the awesome research group in the Department of Biology at the University of Waikato, New Zealand. I am especially indebted to my New Zealand research advisor, mentor, and Pittosporum guru, Dr. Chrissen Gemmill. As part of a summer REU (NSF Research Experience for Undergraduates) I got the amazing opportunity to conduct a research project at La Selva Biological Station in the tropical lowland wet forest in the Sarapiqui region in Costa Rica. Working with my mentor, Dr. Danielle Palow, I quantified and evaluated differences in several leaf functional traits of saplings for 8 species of Inga that occur throughout the La Selva forest plot. Previous work by Dr. Palow shows that Inga species in this region exhibit different soil preferences, with some species occurring on fertile alluvial soils and others occurring on older residual soils. Through my summer project, we found that the Inga species that differed in their soil type preference are also different in several key leaf functional traits. This suggests that co-existence in this diverse genus in this forest is likely facilitated by niche partitioning along a soil gradient, and that the differentiation along this environmental axis is coupled with differentiation in functional traits. Not only did this project solidify my goals of continuing on with research at the graduate level, but it gave me my first taste of field work in a tropical forest and convinced me that I wanted to pursue my research in these incredibly diverse regions. Additionally, this project really started to pique my interest in investigating how evolution influences present-day niche partitioning, species co-existence, and community assembly as a whole.